Submit stories and photos to News Gal. For one of the few times in its long history, the U.S. Military Academy accepted three siblings into the same class. Eighteen-year-old twins Sumner and Cole and their 19-year-old brother Noah, of Nederland in southeast Texas, have each signed on for four years of academics and military training. If all three make it through the rigorous program, they will simultaneously toss their caps into the air as newly commissioned second lieutenants in the Army in 2017. "It helps knowing that your brothers are here, even though we're going to be separated all across campus in different companies, but I'm sure we'll see each other and it will help keep morale a little bit higher," Sumner said after a bus dropped the brothers off early Monday along with some 1,200 new arrivals. The three Ogrydziak brothers received presidential appointments, which are available for children of career military personnel. Their father, Coast Guard Capt. Randal Ogrydziak, is a deputy sector commander based in Corpus Christi, and their mother Kristine served in the Coast Guard for 10 years. Both grandfathers served in military. During the 39th Annual Convention of the National Society of Black Engineers (NSBE), USMA was honored for an historic accomplishment in diversity. Eight African-American professors of West Point’s Department of Mathematical Sciences received NSBE’s Dr. Janice A. Lumpkin Educator of the Year honor on behalf of their department. No other college or university math department in the country has as many African-American professors. The West Point Cemetery has taken in graduates of the Long Gray Line from the age of the cavalry charge to the dawn of drone strikes. Headstones etched with names like Custer and Westmoreland stand near plots with freshly turned earth. And after almost two centuries, the 12-acre cemetery is close to full. The U.S. Military Academy and its graduates are taking steps to make more room with new niches for cremated remains and an eventual expansion of the burial grounds. The work will update a resting place for more than 8,000 people that is the most hallowed ground at the nation's the most venerable military academy. "I would challenge you to find more valor in a smaller amount of space," says cemetery administrator Kathleen Silvia, who notes that 16 Medal of Honor recipients lie here. After a nearly 37-year absence, the New York Yankees returned to Doubleday Field on Saturday and took on the reigning Patriot League Champion Army Baseball Team. The last time the Yankees headed up the Hudson to play Army was April 19, 1976, but prior to that it was a more regular affair with the two teams playing each other 21 times since 1927. While Saturday’s game ended with another Yankee victory, 10-5, making Army 0-22 in the series, Army Coach Joe Sottolano said that the game was really not about winning or losing. "More than the final score," he said, "today was about the lifetime experiences that people can have that they’ll never forget." Read more. In order to help preserve the Labor Day weekend for the United States Corps of Cadets, the Army football team's season opener versus Morgan State at Michie Stadium will kick off at 7pm Friday, Aug. 30. The Black Knights' other four games on the banks of the Hudson are slated for noon starts. All five of Army's home games will air live on CBS Sports Network. "We appreciate the tremendous amount of support provided by the Corps, and we wanted to find a way to ensure cadets could maximize their leave time," Director of Atheltics Boo Corrigan said. "We are mindful of the demands of the Academy schedule and with home games already scheduled for two other three-day weekends this fall, we deemed it appropriate to make this change." Army is also slated for home games versus Eastern Michigan on Oct. 12 and Western Kentucky on Nov. 9. Those contests fall on the Columbus Day and Veterans' Day weekends, respectively, and West Point will not hold classes on the Monday following each game. The remainder of the home schedule includes match-ups with Stanford on Sept. 14 and Wake Forest on Sept. 21. The Morgan State game will mark just the second time the Black Knights have played a game in August. Army opened its 2008 season at Michie Stadium versus Temple on Aug. 29. Season and group tickets are on sale now for all five of the 2013 home games. Season ticket packages start as low as $105 for the "Spirit Zone" section located in the northwest and southwest corners of Michie Stadium. A sideline season ticket is priced at $170, and West Point faculty and staff seats are $145. Current season ticket holders who renew their seats online by April 10 will receive two entries into a drawing with the chance to win several Army Football-related prizes. The grand prize is an Army-Navy football package that includes two lower-level sideline tickets to the game in Philadelphia, two tickets to the annual Army-Navy Gala, two pregame on-field passes, and one night in the official Army team hotel. Fans who utilize goARMYsports.com will also receive a $10 discount on the order fee. In addition, the first 5,800 accounts to renew their tickets online will receiver four passes to one of several exclusive experiences at West Point. Fans can choose from locker room tours, a tour of the West Point Mess Hall, pre-game chalk talks, and other behind-the-scenes events. Those accounts that qualify will receive their invitations in July. In addition to a discount for purchasing 20 or more tickets, Army also offers a sales representative for the seamless organization of group outings. With plenty of tailgating opportunities and a full day of events unlike any other sporting event in the country, a visit to West Point is about more than just the game. Contact your Army group sales representative at 845-446-2375 or odiamktg@usma.edu to book your day on the banks of the Hudson and experience the West Point tradition. 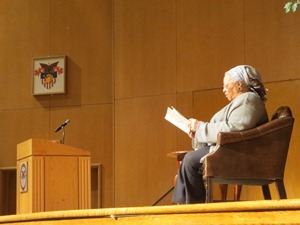 I n Robinson Auditorium on Friday, March 22, author Toni Morrison read passages from her 2012 book Home and answered questions from the Class of 2016 at the 36th Sol Feinstone Lecture on the Meaning of Freedom hosted by the Department of English and Philosophy. Colonel Scott Krawczyk, Department Head, identified Morrison, winner of the 2012 Presidential Medal of Freedom (among numerous other awards), as a great speaker for the lecture. "In her ten novels," Krawczyk said, "the meaning of freedom in America is always mediated by the material fact and long shadow of slavery." Students from nearly two-dozen sections of EN102: Literature, who recently read Home in class for both officer and civic development, posed a mix of questions to Morrison after her reading, some about race in America and others about the novel itself. Called an Odyssey-like tale by some reviewers, Home tells the story of Frank Money, an African American Korean War veteran suffering from post-traumatic stress disorder who must reconcile his past and return to his home in Lotus, Georgia, to save his younger sister from a troubled relationship with her employer. M any in the English program called Morrison, "the most significant literary figure to visit West Point since William Faulkner in 1962." Fifty-one years ago, Faulkner, who won the 1949 Nobel Prize in Literature, spoke to cadets in Thayer Hall’s South Auditorium. In 2000, South Auditorium was renamed Robinson Auditorium for General Roscoe Robinson Jr. '51, a Korean War veteran and the first African American to achieve the rank of General in the United States Army—an appropriate "home" for Morrison, herself a winner of the Nobel Prize in Literature (1993), to read about Frank Money. The Sol Feinstone lecture series was endowed in 1970 by Sol Feinstone, Founder of the David Library of the American Revolution, in order to provide the Corps of Cadets with an ongoing exploration of the many meanings of freedom and to help them become more aware of their heritage of freedom. Since then, the Corps has heard 36 lectures on the meaning of freedom from such notable participants as General Harold K. Johnson '33 (1971), economist Milton Friedman (1984), businessman H. Ross Perot (1999), and Senator Max Cleland (2003). In 2006 the West Point Association of Graduates assumed investment responsibility for this endowment. 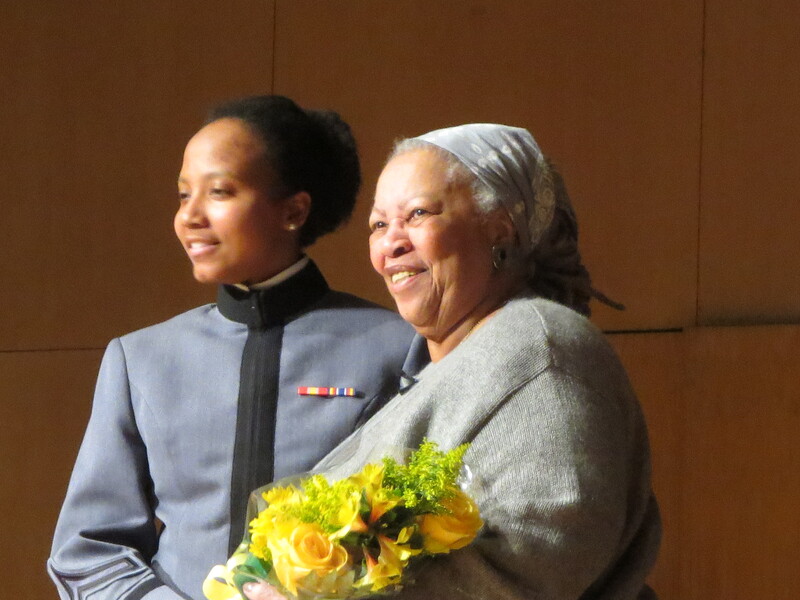 Click for photos and video of "A Night With Toni Morrison," at which cadets performed excerpts of her work. Though it doesn't really look like spring here at the Academy, graduates and subscribers will soon receive their Spring 2013 issue of "West Point" magazine! This issue is devoted to answering the question: What makes the Academy unique? Divided into six primary sections (people, campus, academics, traditions, culture, and alumni), this issue is chock full of tidbits about USMA's past, present, and future -- all of which combine to create an incredibly special college experience. Click here to read the issue online (and get web-only extras) before it hits your mailbox! Across the country, students are beginning to receive appointment notifications in the mail. West Point expects 1,150 new cadets for this incoming class. "The challenge was something Richie Smith willingly and readily accepted two years ago when coach Lon Hazlet took his Panther Valley football squad on a trip to West Point. When a member of the Army coaching staff asked the group that day if any of them would like to attend the United States Military Academy and play football, Smith was the only player to raise his hand. Smith's hard work both in the classroom and on the football field resulted in that goal becoming reality Wednesday when the Panther Valley senior accepted an appointment to the United States Military Academy to continue his education and football career. 'To be honest, everybody always talks about how awesome it looks up there -- the view,' Smith said. 'To me it was the challenge, the actual Academy when we went up there. Their instructors came out and talked to us and said this is probably the hardest school to get into and stay here. That just drove me. I'm always one to accept a challenge and try to strive to accept that challenge.' "
"On Monday James Hickey (left) got the package he has awaited for the last nine months. To make sure he met the physical standards for West Point, Hickey, a former starting offensive lineman on his high school's varsity football team, shed 62 pounds over nine months to get to his now-sleek 178 pounds. In his rounds of phone calls to family and friends, Hickey called his two brothers -- Edward, a first lieutenant, and Thomas, a private first class (PFC), both U.S. Marines. Both brothers were busy at work but took time to welcome him to the military family. Watch your local news for more stories of incoming new cadets from your area! Representing West Point Admissions at the Florida College Fair on Saturday were Jim Wartski '82, Mike Ulekowski '75, Sean Morgan '92, and Jay Carmona (Admissions Department volunteer). The interest in West Point among the high school students was at an all-time high. In today's competitive world for getting the finest student-athletes, West Point was a top attraction at the fair. The lines to talk to USMA Admissions Representatives seemed to be never-ending, often backing up three-deep. Much appreciation to the Admissions Field Force that volunteer their time and efforts to promote the values of West Point and strengthen our alma mater. If interested in supporting local college shows and assist candidates in the application process, please contact the Directorate of Admissions. The alumni can be the strongest asset a candidate can seek to answer questions about life as a West Pointer. Remember as is said in Admissions, "The Corps starts here." Go Army! 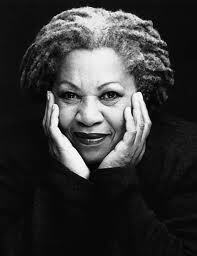 Nobel Laureate Toni Morrison is speaking to the Class of 2016 on Friday March 22 from 12:50-1:40 in Robinson Auditorium. The plebe class has read Morrison's most recent novel, Home, which centers on an African American Korean War veteran struggling to reintegrate into civilian life on the cusp of the Civil Rights era. Professor Morrison's visit will be the most significant literary moment at West Point since 1962, when William Faulkner spoke. As employers complain about a lack of skilled workers and record numbers of college graduates remain unemployed, the American Council of Trustees and Alumni released today the fourth edition of What Will They Learn? The study graded 1,070 institutions with an "A" through "F" on the strength of each school's general education curriculum. Colleges are evaluated on how many of seven crucial subjects outside the major they require of all graduates: composition, U.S. government or history, economics, literature, college-level math, science and intermediate-level foreign language. "A" schools require 6-7 courses, "B" schools require 4-5, "C" schools require 3, "D" schools require 2, and "F" schools require 0-1 courses. "Businesses are struggling to find employees with the skills to succeed in today's high-tech and dynamic global economy," said John Engler, former governor of Michigan and president of the Business Roundtable, of the study. "Those abilities are built upon a foundation of math and science, but they also depend on students acquiring a wide range of general knowledge -- including the ability to think and communicate clearly. This year's What Will They Learn? report highlights which universities are succeeding in this educational mission, and unfortunately, the large number of schools that are falling short." The outcome won't likely be in doubt when the New York Yankees visit the U.S. Military Academy at West Point on March 30 for the 22nd time -- and the first time since 1976 -- for an exhibition game against Army's baseball team. New York has won all prior meetings. 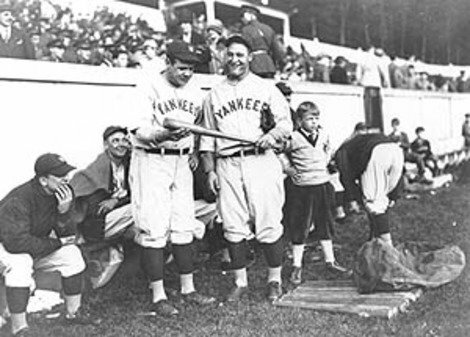 The on-again, off-again series began before the Yankees 1927 season. New York's "Murderers' Row" won the first meeting 2-0 in a one and a half-inning, rain-shortened exhibition that turned out to be the closest the cadets would come to beating the Yankees. Except, of course, for one afternoon in 1966. After decades of being routed by Yankees teams that regularly played their stars, Army came closest to beating the Bombers on April 29th of that year behind the pitching of third-team All-American Barry DeBolt '66. The senior cadet tossed a four-hitter against New York in a seven-inning game but lost 1-0 when Army couldn't score against Jim Bouton. Mickey Mantle batted in the game's only run. 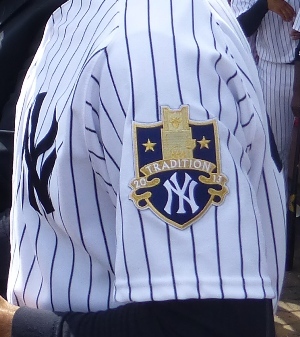 Forty-seven years later, DeBolt -- who plans to attend the 2013 Yankees-Army game -- and his teammates vividly recall the day the cadets nearly beat a Yankees team that included Mantle, Roger Maris, Bobby Richardson, Roy White, Bobby Murcer, Elston Howard, and Tom Tresh. "It was a surreal day. I can remember warming up in the outfield next to Bouton," DeBolt said. "It was one of those days where the next day, you wake up and ask yourself, 'Did that just happen?' "
The Code of Support Foundation (COSF) has announced a spectacular lineup of musical performers who will be joining forces in a special Presidents' Day weekend concert saluting veterans and the U.S. Chamber of Commerce Foundation's "Hiring Our Heroes" program. Dubbed "A Musical VETStravaganza," the concert is set for 3pm on Sunday, Feb. 17 at George Washington University's Lisner Auditorium, 730 21st St., NW in Washington, DC. Doors will open at 2:30pm. The concert is FREE and open to the public, but tickets are required. The renowned 70-voice West Point Cadet Glee Club leads the list of performers, along with the West Point Alumni Glee Club, comprising veterans who average nearly 20 years of service with 75 percent combat veterans among its members. The hot military quartet and Sony Music recording artists "4TROOPS" and CAMMO recording artists "Homefire" Military Spouses Choir (created by 16-time Grammy Award winner David Foster) will add their special talents to the program. Special VETStravaganza guest stars include Mark Wills, a multi-platinum selling country music star with eight top-10 hits to his name, and rising star David Kroll, who recently released a new single, "Little Soldiers," saluting family members who remain at home while Dad or Mom is deployed. According to Maj. Gen. (Ret) Alan Salisbury '58, COSF chairman and CEO, this concert is intended to promote the hiring of veterans and military spouses, and support the U.S. Chamber of Commerce Foundation's "Hiring Our Heroes" program. "Along with the musical numbers, we'll feature a number of local employers such as Booz Allen Hamilton who have great success stories to tell about veterans in their organizations," said Salisbury. "The audience will leave this concert with an appreciation that hiring a veteran is not an act of charity, it's the smartest thing any company can do for their organization." Click here for information about West Point Association of Graduates Career Services. In addition to the U.S. Chamber of Commerce Foundation, a dozen nonprofits are joining with the COS foundation as co-presenters of the VETStravaganza concert. These include Blue Star Families, Iraq and Afghanistan Veterans of America, Institute for Veterans and Military Families (IVMF), Military Officers Association of America (MOAA), National Louis University (NLU), Operation Homefront, Points of Light/Military Initiatives, Student Veterans of America (SVA), Teach for America, USO, and the Wounded Warrior Mentor Program. "This concert is a great example of how the community of military family, veteran, and troop support organizations can accomplish big things by working together," said Kristy Kaufmann, Executive Director of the Code of Support Foundation. "We share common goals and common interests that provide opportunities for cooperation and leveraging our collective resources." Tickets for the VETStravaganza Concert may be obtained online at www.lisner.org or by phone at 202- 994-6851 or through the box office at 202-994-9599. Box Office hours are 10am - 6 pm, Monday through Friday. Can Data Analytics Help Army Beat Navy? Sports provide a structured example of a force-on-force situation. Two competing groups try to gain an objective where success of one group comes at the expense of the other. In sports the goal is to outscore the opponent. The goal of data analytics in sports is to increase a team’s probability of outscoring its opponents. Similar situation arises in war gaming and in strategy and tactics for military operations. We are seeing exciting increases in applications of data analytics to sports. Probably the best known example is Michael Lewis's 2003 bestselling book Moneyball. It describes how, in 2002, the Oakland As made use of statistical analysis to enable their team to compete successfully against other teams (notably, The New York Yankees) with payrolls many times greater. Since then, the use of these methods continues to expand. They are applied to problems including personnel selection, salary negotiations, game practice and game time decisions. In the mid-1990s, at IBM Research, Inderpal Bhandari led a group exploring how data mining could be used by NBA, in particular, The Knicks. The NBA was already keeping detailed, event by event records of every game. His system, called Advanced Scout, was adopted by a number of teams. It enabled them to understand their own teams’ strengths, weaknesses and tendencies as well as those of their opponents. In 2010, I joined the Mathematical Sciences Department at West Point and became a member of the Network Science Center. I was intrigued by the possibility of applying these methods to assist my favorite NCAA Division 1 teams -- Army. I contacted Bhandari and he enthusiastically agreed to join the project. ARO provided funding and over the past two years, six cadets have worked on this project. In Spring of 2010, Cadets Lamar Simmons and Anthony Ruizcalderon Jr. carried out a pilot project. This was extended and refined during the 2011-12 academic year by Cadets Kirby Kastner and Jeremy Maness and are being made operational this year by Cadets Connor Hanafee and Kahlan Maki. The work consists of collecting data about every game played by Army and its opponents over the last four years and looking for "surprising" events. These are things that happen in a game more or less often than we would expect, based on the frequency of other related events. For example, if Army wins the coin toss, the first decision to be made is whether to receive the opening kickoff or to defer to the second half. Does it matter? Analysis of the data showed that we are over twice as likely to win if we defer receiving the kickoff to the second half. The probability of winning when we kicked off first was 47.8% compared to 21.4% when we received the opening kickoff. The U.S. Military Academy welcomed Brig. Gen. Richard D. Clarke as the 74th commandant of the Corps of Cadets Jan. 18 during a change of command ceremony at Cullum Hall. Clarke, the former deputy commanding general of operations for the 10th Mountain Division (Light) at Fort Drum, N.Y., comes to West Point with nearly 28 years of leadership experience at every level of command from company to brigade. As the Corps’ senior ranking officer, the commandant is responsible for overseeing the administration, discipline and military training of cadets. The Yankees are making one additional spring stop before returning home to open the regular season, having agreed to play in a March 30 exhibition game at the United States Military Academy in West Point, N.Y.
Major League Baseball first announced the Yankees' involvement in the game against the Army baseball team, which is scheduled to be played at 2 p.m. ET at West Point's Johnson Stadium at Doubleday Field. "It's a tremendous honor for our organization to play at West Point, which is one of our country's most historically significant institutions," said Yankees managing general partner Hal Steinbrenner. 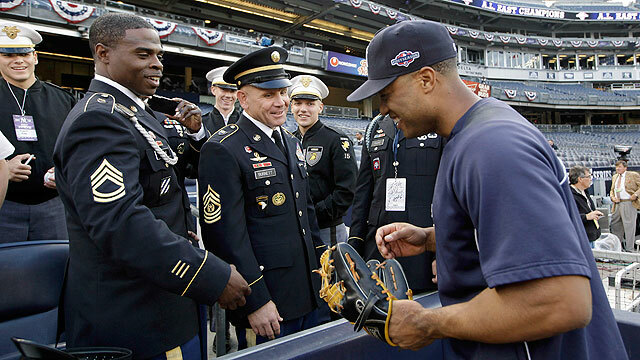 "The Yankees have always held the nation's servicemen and servicewomen in the highest regard. Playing in this game is our way of showing appreciation for their valor and the sacrifices made by all members of the United States armed forces." This marks the 22nd exhibition game between the clubs at West Point, dating back to the era when Babe Ruth and Lou Gehrig were in uniform, and the first visit by the Bombers for a game since 1976. Be sure to check out the Spring 2013 issue of West Point magazine for more on the Army baseball team! On January 19, the West Point Center for Leadership Diversity in Science, Technology, Engineering and Mathematics (STEM) will work with 40 middle school students residing in low-income communities in Hampton, VA. The mobile STEM program is designed to inspire under-represented youth to embrace the world of STEM and share West Point’s competencies with students who might not otherwise be aware of the career opportunities in those areas. The camp-like setting immerses the students in a variety of hands-on activities, such as building and programming robots. The workshop will challenge the students through friendly competition with “robots,” using the new problem solving, communication, engineering, and leadership skills they will learn. This STEM Workshop is the third of its kind in Virginia and all are supported by local West Point Societies with outstanding success. Community members supporting the event include retired general officer Wallace Arnold, a director at Hampton University, and retired general officer Bruce Davis, a senior technology advisor with the Wyle Corp.
President Obama's inauguration next week will mark the 25th time that cadets from the U.S. Military Academy at West Point march in the inaugural parade. The parade, which starts at 2:30pm Monday, January 21, will travel from the intersection of Pennsylvania and Constitution avenues to the White House. The cadets marching in the parade were chosen by a team of evaluators based on their marching prowess and military bearing. First Captain Brandon Whittington of El Paso, Texas, will march with the Army staff. Deputy Brigade Commander Cadet Ross Boston of Chipley, Florida, will lead the Corps of Cadets contingent of cadets. The cadets will be the first unit marching under arms. Cadets have been taking part in inaugurals since March 2, 1873, the second inauguration for President Ulysses S. Grant, a West Point graduate of the Class of 1843. The National Society of Black Engineers has recognized a handful of West Point graduates -- and even a whole department -- with its 2013 Golden Torch Awards. The U.S. Military Academy at West Point is getting a new commandant of cadets, its 74th. Brigadier Gen. Richard D. Clarke '84 will assume command on Jan. 18 in the Cullum Hall ballroom. Clarke has commanded in numerous roles and at bases around the country, including with the 101st Airborne Division at Fort Campbell, Ky.; the 82nd Airborne Divisionat Fort Bragg, N.C.; and the 75th Ranger Regiment at Fort Benning, Ga. He most recently served as deputy commanding general (operations) of the 10th Mountain Division (Light) at Fort Drum, N.Y.
Clarke takes over for Brig. Gen. Theodore D. Martin '83, who moves to the post of commanding general of the National Training Center at Fort Irwin, Calif. 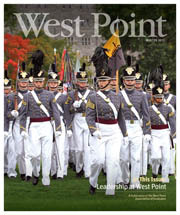 The Winter 2013 issue of West Point magazine is in the mail now! 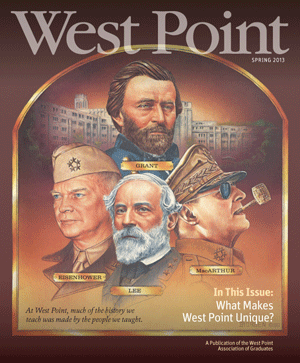 This issue is all about Leadership at West Point. You'll find features on Athletic Director Boo Corrigan, the implementation of Branch Week, and much more! This edition also highlights the Campaign Cabinet and its members tell us exactly why it's imperative to support the Academy.